This final episode for Steve Carell was a lot of things. It was subdued, emotional, tasteful, and had believable moments all exercised with ban-aid quick removal. It was also good TV. Perhaps Steve wanted the Michael Scott character to go out in a polar opposite way to the tragic crash and burn exit for his British predecessor David Brent. Instead, he and the writers chose a more dignified exit. One that leaves us admiring and longing for the character's return. All of a sudden we sit thinking to ourselves, 'but he was so young' or 'he was in his prime'. One reviewer suggested that producers crafted the story line to demonstrate that the show would survive without Steve Carell. I slightly disagree with this take, as I believe the episode had the opposite affect. I now believe more than ever that without this strongly written misfit character, who truly loved his job and the people/family that worked for him, it will be difficult for the writers to salvage the episodic atmosphere that made the show such a success. 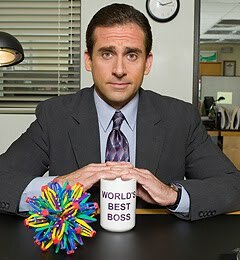 Steve Carell and the Michael Scott character pulled off a unique balance for the show that allowed for the group of strong supporting characters to bumble through life with the protection of an equally dysfunctional but caring boss. If the network tries to introduce a new boss or leading character that will struggles to force the staff to be professional and productive the writers will quickly handcuff themselves as this type of comedy conflict will quickly get old. Getting back to the episode itself. the British version took a huge risk by painting the ending as a dark comedic tragedy. Audiences typically want everything to work out for the characters that they love. However Ricky Gervais pulled off his orignal vision for the series and wrote himself out of the series in the same way he wrote himself into TV history. It would have been unrealistic for David Brent to all of a sudden come to his senses and leave with his class and dignity intact. And knowing this Ricky (genius that he is) catered to his intelligent fans who as he suspected would want the series to remain true to itself and end in a realistic conclusion. In fact he went even further then expected and wrote Brent out in a way that pretty much guaranteed that he would never be able to return as it was apparent that the character's downfall was a result of serious mental illness. Talk about guts. On the other hand it was clear from the beginning that the American version of The Office was trying to carve out a different niche by giving us an over the top goofball boss, with an endearing childlike side. Both bosses were obviously hungry for the acceptance and love of his minions, but the Micheal Scott character differed by being much more stable and for the most part humble. Where we pulled for Scott we often felt sorry for Brent. Where David Brent never was able to see his weaknesses and mistakes, Michael Scott often came to the realization on his own or with the help of Pam or Jim. David Brent had no one looking out for him. So given this extra layer of sanity the Michael Scott character definitely had to leave in a different way. Audiences may have expected a crazy, big going away party full of hugs, tears and sappy flashbacks (ala Seinfeld). This would have given Michael exactly what everyone thinks he wanted which was the recognition that he was a comedic genius of a boss that everyone loved. But instead, like the British counter part the american team took the higher more difficult road and had Michael sneak away in the night almost unnoticed or heralded at all. Out with a whimper and not a scream. This further showed us that Michael Scott was a real character that felt too strongly the internal struggles of the legacy and friendships that he would leave behind. In additi0n, the Michael character may have slightly been doubting his own popularity and was afraid that he may find that his staff would be okay without him and that perhaps he was not as loved as he might have thought. So leaving them as he did may have been a better way for him to remember the people the way they were in their odd tired benevolence. And just maybe if he left that way they would come to the realization that he wasn't so bad afternall. He was however able to leave with a meaningful imression with the characters that he was closest to, by sharing special moments (Jim, Pam and Dwight (in the only way that he could)). He seemed content to leave the others the way he remembered them best, often in small moments and even groups at a time. It was interesting that he tried to make amends with some of the characters that he struggled the most with in his relationship by offering them quaint parting advice or pep talks in an attempt to make them believe in themselves and repair some the the damage that he may have thought he contributed to. In my eyes this was the series ending as the post Carell version of the show will likely need to be quite different in order to survive. As a series finale, I will remember it foundly.